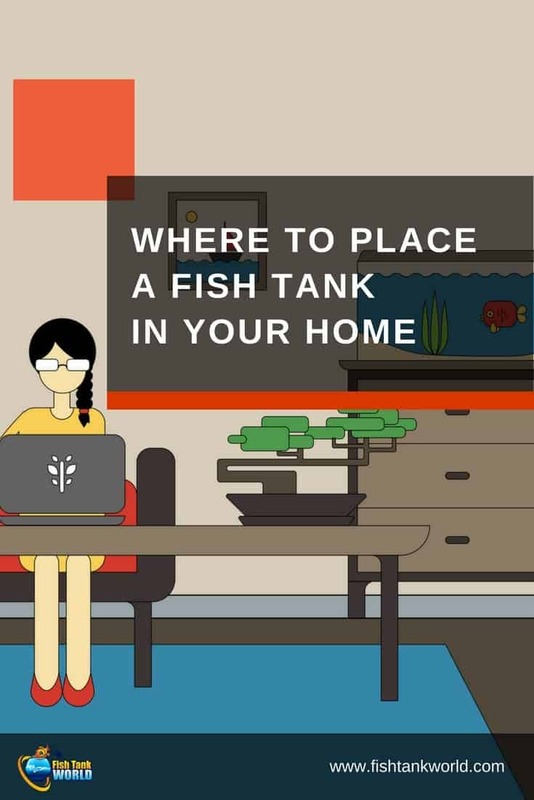 Whether you’re setting up an aquarium for the first time or moving an existing tank into a new home or apartment, it’s a good idea to figure out the best place for it ahead of time. Your home, apartment or office may have several open spaces to host an aquarium but not all of them may be suitable for your aquarium. This guide will lead you step-by-step through the process of determining the best locations to set-up your aquarium. Is a water supply near the aquarium? You may think this is an obvious statement but size means more than dimensions. The larger the aquarium, the more water it will hold. 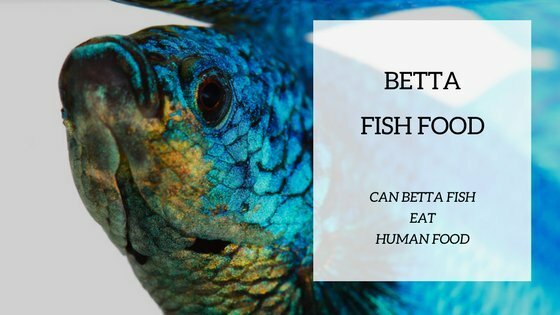 That translates into more weight and aquarium weight is a very important consideration. Nano and desk-top aquariums are very popular. They don’t take up much room and are perfect for apartments, office tables and kid’s bed rooms. These tanks can be only a few gallons up to about 20-gallons. But did you know each gallon of water weighs about nine pounds? A five-gallon desk-top aquarium will weigh over 45 pounds. A twenty-gallon aquarium will weigh close to 200 pounds when full of water, gravel and ornaments! 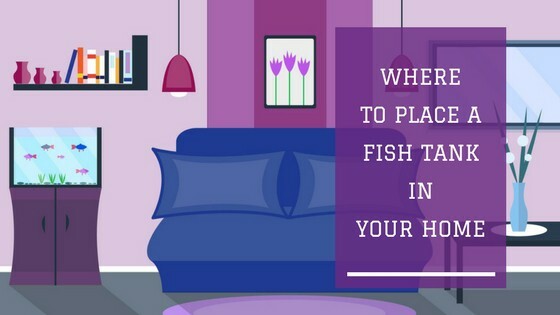 The first priority is determining if it’s safe to place your aquarium on that table, shelf or counter. Kit furniture, made of pressboard, may look nice but it is not designed to support heavy loads. You may even be able to put the aquarium on the piece of furniture but over time the particle-board components can weaken. Simple tasks like cleaning the aquarium glass or changing water puts even more shifting forces on the “soft” wood particles. Another potential trouble spot is a child’s dresser or chest of drawers. A dresser can support a small aquarium but the extra weight could make the dresser top heavy. A curious child may try climbing on an open drawer, causing the dresser to fall forward due to the weight imbalance. The home’s floor must be strong enough to support the weight, especially with a large, heavy aquarium. They can cause the stand and aquarium to twist under its own weight. This will force the silicon seams to pull away from the glass, causing a catastrophic leak. If the floor is uneven, level the aquarium stand before placing the aquarium on top. Never level the aquarium by placing shims under the tank. Level the stand and the aquarium will be level without undue stress on the glass. The bottom line is to make sure the aquarium is in a location that can handle the weight. Purpose built aquarium stands are designed to support the weight of the tank, water, gravel and ornaments. Water temperature directly affects the biological processes of all aquatic life. This includes fish, plants, snails and even the bacteria that biologically keep the tank clean and healthy. 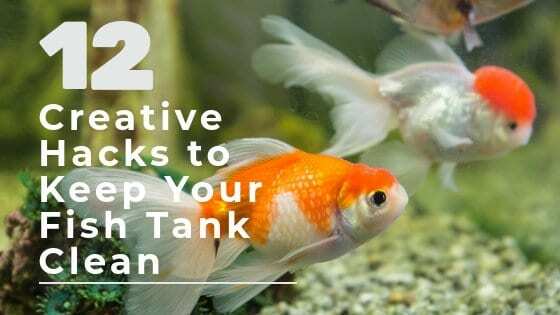 Your tank’s aquatic life thrives when the water temperature remains stable. An aquarium heater will increase the water temperature if the room temperature is a few degrees below the optimal set point but it can’t compensate for extreme cold. If your aquarium is placed near an air conditioner or HVAC duct, it may get a direct shot of cold air. A lot depends on the type of cooling system and temperature dynamics in the room. Modern HVAC systems are designed to “gently cool” the room without sending out a blast of frigid air. Older air conditioning systems may not be so friendly and rapidly chill the area around the vent. The same applies for heating. The area around a freestanding wood stove is not ideal for an aquarium. In the “old days” aquarists were told never to put an aquarium near a window. The logic was the sunlight would overheat the water. Placing an aquarium directly in front of a brightly lit window “could” cause a temperature increase but in today’s climate controlled homes and offices this is unlikely. You’ll find aquariums installed in aquarium shop windows, glass-enclosed car dealerships and exotic tropical hotels. The best advice is to take the time to check out potential locations and see if they are subject to temperature extremes. Aquariums need electric power for the filter, heater and light. That is a minimum of three electrical sockets. For most desktop, goldfish and tropical aquariums this is all you’ll need to power the tank. A single 15-amp outlet will easily provide the electricity for the aquarium. Plug the cords into a high-quality power strip, mounted off the floor and away from potential water splashes. Make sure all the wires are configured in a drip loop. Every electrical aquarium product comes with a manual describing how to set up a drip loop. The loop prevents water from running down the power cord and into the electrical outlet. This simple safety precaution should not be ignored. You know you need power but is there an outlet nearby? If not, is it acceptable from a safety or aesthetic standpoint to run an extension cord from a distant outlet? If you’re setting up a reef aquarium the power requirements are even greater. You will need a power supply capable of handling one or more return pumps, wave makers, protein skimmer and reef lighting. If your building an automated aquarium you’ll probably need to run a wireless hub or controller to synchronize all the hardware. Dosing pumps and remote sensors will also need a power supply. You may even be running a chiller to keep the reef water cool. For more complicated aquarium systems it is best to “map out” the power requirements and assemble a safe power strip configuration that is not overloaded. Saltwater “creep” always seems to find electrical outlets so be sure to keep outlets and plugs free of salt crust. Crusty outlets can arc and start a fire! Like electricity, you’ll need water to fill, clean and top-off the aquarium. If you’re new to aquarium keeping, get ready to carry water. Aquariums lose water through evaporation. This is especially true in the warm summer season or if the aquarium is in a low-humidity, climate controlled home or office. You’ll fill the aquarium once when you set it up. But that’s not all. The aquarium will “drink” quite a bit of water every week. It will need weekly top-offs. Reef aquariums need daily top-offs to compensate for water loss due to protein skimming and evaporation. Water changes will go smoother if your water source is close by. Ideally you’ll be able to blend hot and cold water to match the aquarium water temperature. In office buildings a janitor’s mop room will often have hot and cold water. Carrying a bucket of water from the basement or other side of the office can become tedious. If distance is unavoidable, a small cart for transporting a bucket of water is helpful. You can even run a hose from the water source to the tank, using a ready-made aquarium hose kit. It may seem ironic but once you fill your aquarium with water you’ll also be taking water out of it. Water changes are one of the most effective ways of keeping the water clean and clear. That means monthly maintenance that involves removing water and replacing it with new freshwater or artificial seawater. The filter and ornaments will occasionally need to be removed from the aquarium and scrubbed clean. A kitchen sink is the ideal place to work. Keep in mind that family members and co-workers may not appreciate “fish water” being near dishware and food preparation. Cleanliness and off-hours maintenance can solve these objections. Dirty aquarium water can also be poured into the toilet and flushed away. A janitor’s room often has a mop bucket dump station, making water disposal easy. 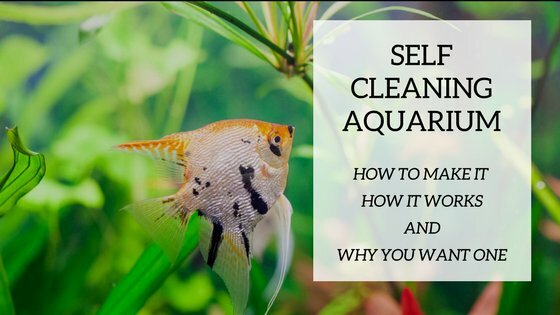 Since aquariums are made of glass or acrylic, they can become scratched or chipped by a variety of common objects like vacuum cleaners, brooms, toys, just about anything solid. Aquarium stands can also be damaged by objects that rub against the finish. When choosing a location for the aquarium, think about who and what travels near the area. This is especially important in a public or business location when people and materials may frequently pass by your aquarium. In your home it might not be a good idea to place the aquarium next to a busy hall. Entrance doors are often the spot where people come in with arms full of bags, packages, and household supplies, making it easy to bump into the aquarium. Make sure this is plenty of open space around your aquarium to avoid bumps, scrapes and difficulty moving past the tank. It may seem strange to put the best viewing location at the end of the list. It’s at the end of the list because the best viewing location may not be the best spot for the aquarium. Some items on this checklist, like electrical safety, can’t be compromised. Other categories are going to be a trade-off between what ideal vs what is practical. It’s obvious the reason we have aquariums is to look at them, right? The best viewing location depends on the available aquarium friendly space and personal desires. For some, a darkened room is the most desirable for viewing a reef aquarium. For others, a prominent place in the family room or office is the ideal location. Since no two aquariums are the same, only you can decide on the best location for your tank. Use this guide to help determine the best location for your unique aquarium.